Bill Drakeley accepts THREE Gold Awards for this glass tiled, knife-edge beauty, fondly referred to as the "jewel of the property" by our client. Close up detail of the custom cut black absolute granite Lautner Edge. The award-winning pool, located in Roxbury, Conn., was completed in August 2015. The pool and adjacent spa with thermal shelves are of a knife-edge slot perimeter overflow design (Lautner Edge). 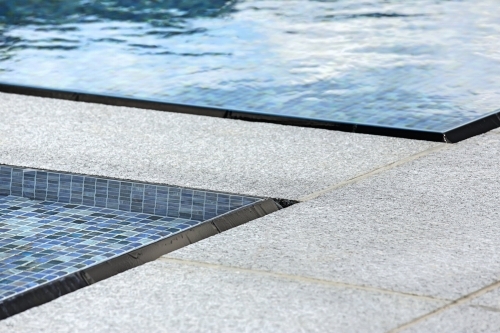 The knife-edge is a 6"x12" custom cut black absolute granite, which was installed at a positive elevation vis-a-vis the decking: the water elevation is 1/2" higher than the surrounding decking for a glass-like effect. The pool and spa are completely crusted in a custom blue mosaic blend of 3/4" Italian glass tile, installed in smooth radius curves over the shelves and benches for swimmer comfort. 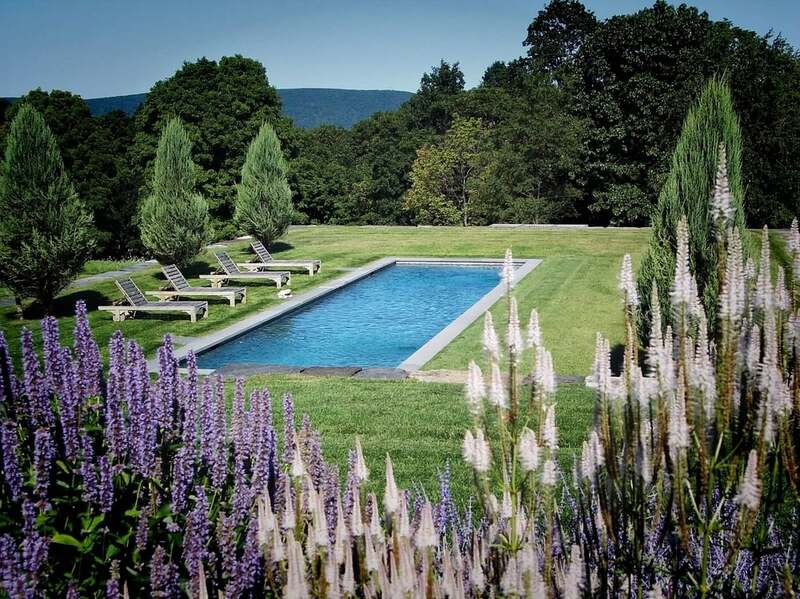 In the words of the client, the swimming pool is "the jewel of the property." The custom blend Italian glass tile was installed in smooth radius curves over shelves, benches, and steps for swimmer comfort. The Awards Celebration for the 2016 Awards Competition was held at The Pool & Spa Show in Atlantic City on January 24th. The Pool & Spa Show is the premier tradeshow for the pool and spa industry where industry professionals gather to attend over 4 days in professional training as well as visit with companies producing the latest products and services for the industry. This year more than four dozen companies submitted over two-hundred entries between the Builders Competition and the Service Competition resulting in 91 awards being given across both competitions’ categories. Competition was once again high as these awards continue to be viewed within the industry as a benchmark of professional achievement. Each pool was judged based on creativity, functionality, project cohesiveness and overall cohesiveness with the environment. The Outstanding Achievement Awards - Builders Competition recognizes NESPA members whose installation of pools, spas, hot tubs and water features represent the best our industry has to offer.